And now for the moment I've been waiting for. I've managed to acquire quite a few Ardbeg bottles because Ardbeg is almost always great whisky. always seems to be great quality. So we've got a lovely line up today. Starting with the Oog and Corry, we'll then go back to when they were being run by the guys at Laphroaig. A 1996, a 1993 and a 1991. Nose: Smoky bacon, BBQ, ash, soot, a little medicinal, burnt brown sugar, more sweet sticky BBQ, sweet meaty sulphur, lime jelly baby, juicy orange. Water: Bigger sherry, big orange and lime juiciness, marzipan, cinnamon, jelly babies, some sour lime too, ash, charcoal. More dark and earthy after a bit- Leather, coffee and dark chocolate. Also sticky toffee pudding, maple syrup and caramel. Fresh and juicy while still dense and earthy. Taste: Big intensely sweet arrival on brown sugar, dirty orange and lime citrus, quite juicy smoke coming up, campfire, peat smoke, creamy oil, oily malt, then the citrus and smoke intermingle more with some sweet BBQ and a juicy burst into the finish. Water: Sweeter and juicier- Orange and lime powerful and pure, then ashy and more earthy complexity with some dirty sherry. Some spicy white pepper. Finish: Long length. Sweet and earthy with malt, kiln, sherry and a little spice. Water: Drier with sour lime and coffee, some salt coming through. Notes: 12/2014 batch. 10% older sherry casks, can't be too old at the moment though. It's beautifully made, wonderful balance. Gets better every time I try it. A fantastic whisky for the price. Also worth noting I've had a batch from 2015 as well and it was even better! Water: More sweetness, more vanilla, more sweet sulphur, sweet orange. More orange after a bit. Taste: Big and intense. Creamy, oily, lots of peat smoke, cough sweets. Developing citrus sweetness with lemon and lots of lime and then building spicy tannins with lots of intense ginger and white pepper. Water: Much softer arrival, building smoke and citrus- Lots of orange and lime but much more creamy. The oak kicks in after a few seconds with lots of spice- Ginger, nutmeg and white pepper with fresh oak. Finish: Long length. Light peat smoke fades with spice staying- Oaky tannins and lime citrus. Notes: Finished in virgin Limousine French oak casks. Not as complex as the Oog. Again, great whisky. Doesn't quite live up to it's brother though. Just a tad too spicy and a little less balanced. Onto the oldies, well, for Ardbeg standards. The next 3 are all IB's from the 1990's. This next one I bought online from Hard to Find Whisky, I got it for £85 but it sold out in about an hour. Nose: Wonderful. Very tropical, juicy and fresh. Old Laphroaig-esque complex fruitiness, juicy pineapple and mango combo, banana, cinnamon buns, creamy smoke in the background, oily lime. A really beautiful nose, very much reminiscent of Laphroaig 25 for me. Water: A lovely fresh orange note comes out with more lime citrus, it's lost the smoke though. Taste: Gentle arrival. Wonderful sweetness, a little oily malt, banana, a little of that mango and pineapple, then smoke building (yes! ), oily lime, Ardbegian peat, smouldering kiln, peaty malt. Islay all over it. The strength is just enough to keep it afloat. Water: Fresh and gentle. Orange, a little waxy, then then oiliness really kicks up with a lot more spice. Loses the mouthfeel a little. Finish: Medium/Long length. Back to tropical, some smokiness lingering with oily malt and a touch of spice. Water: Longer and more spicy, but less balanced. Notes: Distilled March 1996, bottled 2015. 19yo from 2 Bourbon Barrels. Probably would have been even better at cask strength! Great barrels, great spirit. Distilled the year before Glenmo took over, while the Laphroaig team were still running things. The next I got for Christmas, another purchase from HTFW I believe, before they put the price up to £200. I believe Cadenheads sold this for £80 when it first came out and they seem to be releasing a new Ardbeg every 2 years. Nose: A much more intense medicinal Ardbeg. Bandages, cough syrup, sticking plasters, a little TCP, creamy and oily, peat embers. There's some fruitiness underneath it all- Bandages soaked in lime juice (yes, really), a little pineapple. The oak is also very much present with some spice- Cinnamon, nutmeg and ginger. Water: Much more fruit and spice coming out. Mango, pineapple, lemon and lime, much more oak, tannins, more ginger. More water: More fruity again. More like the 1996 with fresh and juicy tropical fruit. Taste: Intense, hugely big, very medicinal and peaty but there's also fruit and sweetness. The fruit and the oaky smoke and fighting it out and neither can quite best the other, salt, intense lemon, lemon peel, bandages, TCP, plasters, peat embers, kiln, very oily and full. Citrus comes back and goes into the finish. Water: More gentle arrival, much more citrus, building and building with oak and lots of spicy ginger. Then some medicinal notes coming in- Bandages. Very oaky into the finish. More water: More gentle again with less oak and more balance. Finish: Long/Very long length. Still intense and mouth coating. It's not leaving without a fight. Lemon and a little lime citrus and medicinal peat lingers and lingers. Water: More tingling oak tannins. Notes: Distilled 1993, bottled July 2013. 19yo from a Bourbon Hogshead. Laphroaig were the owners at the time, distilling just once a week. A great whisky, unfortunately a little overly oaky. Better without water I'd say. And the last one is a sample from Master of Malt. Nose: A perfect balance of the last 2! Perfect. Medicinal, peaty, fruity and a little oak. Cinnamon hit, mango and pineapple COMBO! X2! Lemon and lime COMBO! X3! Bandages and plasters COMBO! X4! The peat is there, attached to the lime- A little like the 1993. Sucking lime juice through bandages but this time covered in soot. Also oranges, some tar and quite a bit of waxiness with paraffin and camphor. Water: Wonderfully complex, integrated and balanced. The flavours don't really change much but notes are highlighted without detracting from any of the others. A little of the sea and less oak. Taste: Intense, rich and sweet. Wonderfully fruity, very citrus lead with lime, lime juice, lemon peel, grapefruit, a little sour wood, a little chocolate and oak, quite salty too, peat smoke is there, seamless in the background but comes out more going into the finish with chocolate and mocha. Strength is perfect, great mouthfeel. Water: Lemon juice, salt sea water, intense juicy mango, oily pepper, medicinal lime, more sea water then oak kicks in going into the finish. Finish: Long length. Lovely lime citrus and peat embers firing up then guttering with soot. A little chocolate and mocha. Notes: Distilled Feb 1991, bottled Jan 2014. 23yo from a Bourbon cask. One of the best whiskies I have had the pleasure to taste. Better than the 26yo from 1976. Well, I thought it was amazing. Price was steep but it's all sold out now anyway. There is a little sour wood note that detracts from the development but I found it quite small. 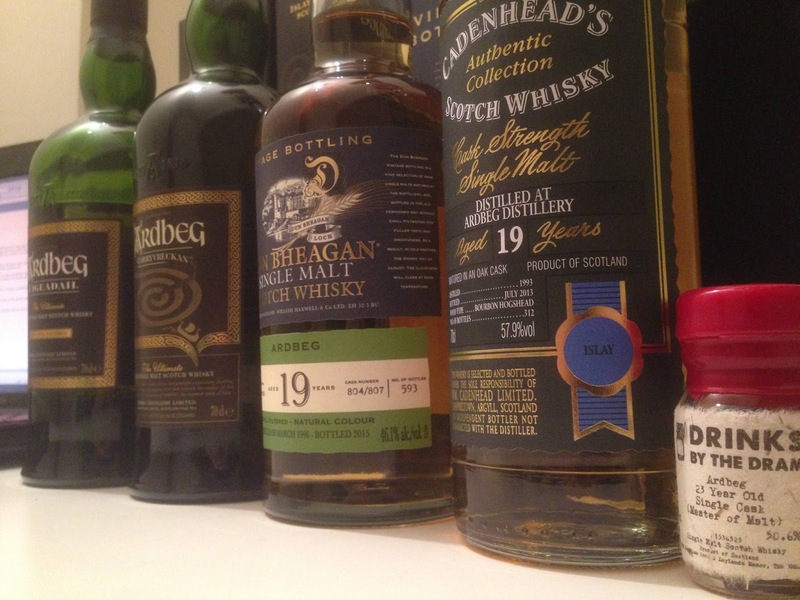 Actually, now that I think about it, all the best whiskies I've had have had small flaws, maybe that's what makes them unique and interesting.